Marian Zimmer Bradley. Image from Wikipedia. 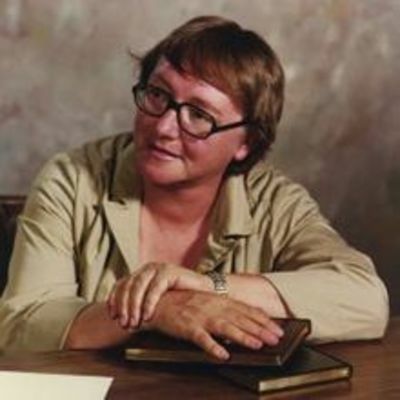 Marian Zimmer Bradley's daughter's accusations that her famous mother had molested her shocked and dismayed both fans of her work and other writers in the fantasy genre such as John Scalzi and Jim Hines. If infomation comes to light that an author you love has done something morally questionable, or even something downright wrong such as child abuse, does that affect how you feel about their work? Can you separate your enjoyment of a book from what you know about the author? Do you think people should stop buying books by an author who is proven to have done something horrific or who holds morally repugnant views? Marian Zimmer Bradley's books were long on my "to read" list since I like fantasy, especially fantasy books written by women, but I don't think I want to now. In general I think it depends a bit on what the writer did. If they just hold a view I don't agree with I can probably separate that from their work, but child abuse is something else. I would probably think of it and that would spoil my enjoyment of the books. Also, I think it makes a difference whether the author is still living or dead. With a living author I wouldn't want to give them my money if they've done something really awful, but maybe it doesn't matter as much if they're dead. I have read a few books from authors long dead (H.G. Wells, H.P. Lovecraft) who had some nasty views (racism, misogyny etc.) but those need to be viewed in the context of the time they were written. It certainly affects how I feel about their work. I would not be able to read this woman's books now. If it was someone I had previously read and really loved their books, then I would feel personally betrayed. I think some time would be needed to grieve, as it would feel like a significant loss. I'm not sure how anyone could disassociate the author from their works! In a postmodern sense, the text is separate to the author, and can be meritorious even if the author is a despicable character. An artist of a comic book I read was removed from drawing because of domestic violence he had committed, but his art is not less well executed because of it. A slightly different example would be the Emperor Marcus Aurelius, who was responsible for some fairly serious persecutions (against Christians), but whose philosophy (ironically very in line with Christian values) is still valuable and worth reading, despite the fact that I don't approve of him putting people to death. On the other hand, fiscally supporting people or causes I'm morally opposed to really grates me the wrong way. I have made a choice to read none of Orson Scott Card's novels, despite loving Ender's Game, as since reading that I learned that not only has he been outspoken against muslims (in some pretty harmful comments), but also donates money to anti-gay organisations (and personally took part in opposing gay marriage in America). The idea that my purchases would fund propaganda against gay people was enough to stop me contributing money there, even though I have heard his books elegantly defended not only on their own merits, but also as tenderly showing views of acceptance and understanding between people, a value Scott-Card does not seem to show himself anymore. Or: It's not enough to make me hate a book, but it's enough to make me hesitate and really consider what I'm reading. Was that Rat Queens, with the artist on DV charges? I was disapointed to hear about that but I still loved the book and I have pre-ordered the next one. The writer and others involved with it aren't to blame for what he did so I hope they don't suffer financially for it. It's a pity about Orson Scott Card too. I also enjoyed Ender's Game, having read it way back before I'd heard about any of that. Yeah it was Rat Queens. So sad because the book was amazing fun, but you're right that it's not right to punish the other creatives involved. Orson Scott Card apparently started out as pretty nice, and grew insane over years. It seemed 9/11 affected him pretty deeply, and have encouraged certain anti-muslim talks. Jeffrey Archer. Have not read any of his books, nor intend doing so, after his little stint in gaol!